I’m from Manchester England. I’m 49 years old. I have a BSc in Mechanical Engineering from Nottingham University and a Master’s in International Management (MIM) from Thunderbird, The American Graduate School of International Management in Phoenix, Arizona. After graduating from Nottingham in 1985, I knew I wanted to gain some international experience. I was lucky to be employed by HiRoss, an Italian manufacturer of precision air conditioning. I was first based in the main factory in a small town located between Venice and Padova, and then moved to the International Marketing Division in Milan. I have been in the HVACR industry ever since. It was really just an accident. I was motivated by a desire to work internationally and the first opportunity happened to be with an air conditioning company. After working for HiRoss in Italy, I got a chance in 1987 to move to the US, which I took, and ended up working for another precision air conditioning company, Airflow, based on the East Coast in Frederick, Maryland. My first position was Regional Sales Manager, and I was then promoted to General Sales Manager, responsible for sales and service worldwide. I took a year out in 1994-95 to go back to school and get my Master’s in Business at Thunderbird, and, thereafter, became the International Sales Manager for Crispaire in Atlanta, Georgia. In 1998, I moved to Farr Company in Los Angeles as its Vice President of International Sales and Marketing. In 2000, Camfil, then the European market leader in air filtration, bought Farr Company to create Camfil Farr. In April 2001, I relocated to Singapore as President of Camfil Farr Asia, with a mandate to build the business across the region, from New Zealand to South Korea and everywhere in between. Over time, we were able to build a profitable USD 100 million+business, employing more than 600 people. I believe that we are now the largest and most profitable filter company of our type in Asia. In 2011, the Middle East was added to my portfolio and, as President of Camfil Farr Asia and Middle East, I relocated to Dubai to drive growth and profitability in this region, along the same lines as the success achieved in Asia. The first full year in this region, 2012, exceeded all expectations, and we are all looking forward to 2013 and beyond with a lot of excitement and optimism. Camfil is a great example of a successful family-owned Scandinavian business. It’s a fantastic company to work for. The owners are still very much engaged at the Board level and, together with our CEO, they continue to set the tone for the whole company. I would say that even as we have grown dramatically over the last few years, the company has still, as far as possible, retained the feel of a family company. The owners have remained engaged and accessible to all levels of the company. If I had to characterise the Camfil culture in one word, it would be “trust”. I think our employees trust us to provide a rewarding place of employment, to treat them fairly and equitably, and to do the right thing. We have been successful at retaining a very high percentage of key long-term employees that understand the “Camfil Way” and have helped to foster and perpetuate our culture, even as the company has grown. Another aspect of the trust-based culture is the freedom given to local managers to manage their businesses. The philosophy, as we built the business across Asia, was to hire extremely competent local people, work together with them to set clear goals, agree upon broadly defined strategies and tactics, and then, get out of the way and let them work. If you run a local Camfil business, then within the constraints of the overall Camfil philosophy, you are trusted to run your own business as best suits your local market and your local customers. I think that this trust is the key to being able to recruit and, then, retain the best professionals available in our industry. Similarly, I think this culture of trust also extends into the marketplace and our relationship with our customers. With a Camfil product, you always get whatever is written on the label. But, we have remained committed to delivering high-performance products regardless of the competitive environment. We just don’t compromise on product performance and will walk away from a job rather than deliver something we know won’t perform as specified. I think that, over the years, our customers have come to understand and trust that approach. In Camfil, there is a complete intolerance to deceiving anyone, be they customers or colleagues. At Camfil, the leadership values human capital. It’s something ingrained in Scandinavian culture. When I hire managers, I tell them that working for Camfil is not a job but a lifestyle. I tell them that they can expect a call even at 11pm on a Sunday. It’s important to be committed to what you do. They are expected to work hard. But they are treated fairly. People working here like winning, and there’s a real sense of achievement. The rewarding thing for Camfil employees is to know that many of the applications we deal with – food, medicine, microchips, etc. – are all of great importance to society as a whole, placing Camfil in the middle of some of the world’s most critical industries. I think air filtration can now be clearly divided into two subjects. Firstly, the area of process or industrial air filtration, where clean air is required to operate equipment, manufacture a specific product and/or to protect people or equipment involved in these processes remains a growing and technically demanding area. For example, as the geometry of microchips grows ever smaller, the demands placed on the cleanliness of semiconductor manufacturing space now require Camfil to design and supply filters that remove even specific molecules down to levels of parts per billion. Similarly, as the requirements for manufacturing medicines or processing foods become more stringent, these areas also offer plenty of commercial opportunity and technical challenges for a company like Camfil. Secondly, of course, there is the application of air filters in populated spaces. Although good filters do contribute significantly to the overall condition of a building by reducing maintenance and repair costs, the primary role of filters in this arena is to protect people. This is a subject that is attracting ever-increasing attention, initially within the HVACR industry and, now, even at the individual consumer level. The awareness of the importance of Indoor Air Quality (IAQ) and the role air filtration has to play in delivering good IAQ is growing almost daily. The statistics on this subject are just staggering. The World Health Organization (WHO) estimates that lack of clean air causes more than 2,000,000 premature deaths every year. In Asia alone, where the pollution levels in most major cities exceed WHO guidelines, a recent report estimated that more than 500,000 people a year were dying prematurely as a result. In the US, an EPA study estimated that the Clean Air Act will save over 200,000 lives and prevent 200,000 heart attacks, 2.4 million asthma attacks and the loss of 17 million working days. If we bring the issue down to the local level, in Abu Dhabi, it has been reported that one in seven children has asthma, and one in five children has some sort of upper respiratory problem. Respiratory infection for the population as a whole is reported to be the second most common non-life- threatening medical issue in the Emirates. Those of us living here know this to be true at an anecdotal level – everyone knows someone on any given day that is coughing, has asthma or is suffering from something similar. On top of all that, there are new studies emerging almost every month linking IAQ to reduced worker productivity, to employee absenteeism and morale even to student performance in schools. Clearly, as the world economy grows, as the population and global GDP grows, we will see more production facilities, more cars, more pollution and a greater need to protect people from this increasingly polluted world. This is a challenge facing not just the air filtration industry, but also society as a whole. How do we stay healthy? How do we protect ourselves? How do we protect our children who are growing up in this world? It’s a large and complicated issue that reaches, as I said, far beyond the air filtration industry, but is surely an issue that it is very important for society to address. When you take a minute to look at the numbers involved, at the human cost, it’s hard not to get carried away by the entire topic. For me, it’s great to have a chance to work for a company where you feel you can make a difference in such an important area. If I specifically address the challenges in the emerging markets – in Asia and the Middle East – then, without a doubt, there are a couple of key issues. The first is an absence of any real legislative imperative to provide a minimum standard of IAQ for occupied spaces. This is an area where governments in the emerging markets still have lot of work to do to protect the local population from hazards that are, by now, clearly understood and well documented. I think this is an area where our industry as a whole needs to do more to engage the appropriate authorities, to explain the issues as we perceive them, and to push for tighter legislative protection for all of us that are subject to poor IAQ on a daily basis. The second major challenge, which is related to the above, is the absence of any local reputable independent third-party verification and certification of air filter performance. Unfortunately for all of us, a glass full of clean air looks a lot like a glass full of dirty air. The really small particles that are potentially the most damaging to our health, the ones that can be taken down deep into the lungs and even enter the blood, are invisible to the naked eye. This absence of performance measurement and independent third-party testing creates an opportunity in the marketplace for low-cost suppliers to cut corners and provide products that don’t perform as labelled and, as such, expose building inhabitants to risks they could reasonably have expected to have been eliminated. These low performance filters are often attractive to customers because of their low initial cost and of their apparent low pressure drop. Of course, it’s easy to offer a low pressure drop on a product that isn’t capturing any particles. But that misses the point of the product entirely. I think that, although data regarding the health and performance implications of IAQ are now readily available, and a good filter’s key role in delivering improved IAQ is widely accepted, the full implications of poor filtration haven’t yet really been understood or accepted at the design level. It seems that air filters are often still seen as either “grudge purchase” or just as a box to be ticked, while other more important issues relating to the HVACR system are addressed. As part of that box-ticking process, we see consultants who are willing to accept any filter product label at face value without requesting any real proof of compliance with even a minimum specification. Unscrupulous low-cost suppliers can label their products however they wish and are rarely challenged by the approving consultant to prove their performance claims. I think the perception is that “it’s just a filter”. However, even if you set aside the implications of poor IAQ, filter performance still has an important impact on the entire HVACR system. Dirty coils run less efficiently and present a higher pressure drop. Dirty ducts also present a higher pressure drop, a health hazard and elevated cleaning costs. Dirty air entering a space increases cleaning and maintenance costs. In a modern well-designed HVACR system, there is no such thing as “just a filter”. But, unfortunately, this seems to remain the prevailing view. I think that all the reputable suppliers in our industry face these same issues. So, I think we need to work as an industry to address these challenges. I also understand that any legal process is a complicated and time-consuming activity that must consider the interests of many diverse groups and, as such, legislative changes cannot be made quickly. So what can we do in the short term? I think the key is to continue our efforts to make the relevant information available to all parties and to try to communicate our message as clearly and impartially as we can. The primary focus for these efforts has to be the engineering consulting community. Camfil, like most reputable suppliers, has a broad range of design and selection tools we are happy to share with interested consultants, whether designing a clean room or an office space. We can provide selection tools that simplify this process and quantify filter performance, operating cost and even the carbon footprint of the filter combination selected. We need to work harder on making these tools available to all our consultant colleagues. I also think that, in the absence of local legislation, responsible suppliers have a duty to promote and raise awareness of the recent EN 779-2012 standard adopted in Europe. This standard allows for the reliable testing of filters and publishes the resulting data on a public Web site for anyone, including consultants and owners, to verify both filter efficiency and the energy consumption over the lifetime of the filter. Under this standard, any EN 779-rated filter will come with both a filtration efficiency (G4 – F9) label and an energy efficiency (A-G) label. The labels will look familiar to most people. They will have seen similar labels on, for example, their refrigerators and other household appliances. They are colourful, simple and easy to understand. It is the contractors who are out to maximise their profit margin. The bigger challenge is the inability of consultants to ensure if the claim made by manufacturers is accurate. In the US, you have a system of an independent, open market-sourced, third-party report confirming the specs by the manufacturer. In an open market-sourced report, the testing body buys the products on its own (as opposed to receiving it from someone) and the testing is done independently. This approach guarantees that the test is valid. So, consulting engineers in the US have this mechanism to ensure that the filter they recommend delivers what it promises to deliver. Consulting engineers in the UAE do not have the benefit of such a system. In the absence of this, the easiest way to overcome the vacuum is to specify as per EN 779, and that way, they can make an informed choice. In EN 779, there is a whole matrix of filter efficiency and energy efficiency. And because it is independently tested, the consulting engineer has a tool to ensure he is getting what he is asking for. In the longer term, it would be ideal to see the development of local standards and local testing capabilities in order to bring some level of transparency and regulatory detection to the region, as in the US. In the meanwhile, consulting engineers can avail of available tools, and the best is EN 779. Therefore, we urge consultants to reference this new standard and the published performance data as a basis of specification. Using this standard will allow both the consultant and the end-user to make informed selections and to be sure they are finally receiving the products they are specifying and, ultimately, paying for. Certainly, the process filtration side of Camfil’s business is very R&D-driven. We are constantly challenged to find new solutions to newly emerged challenges uncovered as our customers continue to push back technological frontiers. On the HVACR side, our R&D efforts are focused on reducing the Total Cost of Ownership (TCO) for our customers, which would encompass extending product lifetimes while reducing energy consumption and the related carbon footprint without compromising filter efficiency performance. Although Camfil is celebrating its 50th anniversary this year, I remain convinced that this is an industry still in its infancy. There are new opportunities emerging every day. On the process filtration side, more sophisticated equipment, processes and products, and more stringent regulations are driving the need for cleaner air and better filtration. A decade ago, we all thought that semiconductor manufacturing clean rooms were huge clean spaces. Then, the flat panel industry came along and demanded clean rooms 10 times larger. There is growing demand for clean spaces in an ever-growing range of industries, from food production to telecommunications. It’s hard to predict what technological breakthrough will drive demand 10 years from now. But, there can be little doubt that the demand for cleaner processes will continue to grow. With regards to clean air for occupied spaces, again, we feel we are only at the beginning of the demand curve for this industry. In 2010, the United Nations General Assembly explicitly defined access to water and sanitation as a human right and acknowledged that such access is “essential to the realisation of all human rights”. As part of the bigger picture, I believe that there are many parallels between access to clean water and access to clean air – after all, we all consume far more air every day than we do water. And I can easily envisage a day when access to clean air is also defined as a basic human right. More specifically, I think the growing awareness at both an industry and at consumer level about the importance of good IAQ will continue to drive increased demand for high-performance air filtration products for years to come. In addition, I’m sure we will see the emergence of a new segment driven by the idea that, having become more aware of the health risks of poor indoor environments, individuals will start to take responsibility for their own IAQ. I think informed people, unable or unwilling to secure an improvement in the overall IAQ of an occupied space, will turn to “spot cleaning” in the future in far greater numbers. I think this will occur in both offices and home spaces with individual high-performance filtration units installed in specific offices, critical rooms and spaces to create “sanctuaries” of clean air. With regards to the bigger picture, I think the benefits of improved IAQ are broad and far-reaching. Camfil intends to do its best to contribute to improved IAQ and, therefore, improved public health across the region. Operationally, Camfil is committed to investing locally in the region as part of a long-term commitment to developing our business across the GCC. We are currently in negotiations aimed at establishing our first manufacturing footprint in the region. We hope this new venture will create an initial 40+ new jobs, and we obviously have the goal of growing that manufacturing footprint to serve the local market as our business develops. I would say finally, but perhaps just as importantly, Camfil is also an industry leader when it comes to sustainability. We were the first company of our type to publish an annual Sustainability Report detailing our commitment and our actions in this area. Our Sustainability efforts, called Camfil Cairing, are completely consistent with the UAE’s stated goal of securing a sustainable future, and we hope that we can play our own small part in helping to achieve those national goals. I am at that stage in life where I hope to be a mentor. But, when I look back at my career, there were certainly several key individuals from whom I learnt a lot, and that made me see life, both personal and professional, perhaps in a different way. Starting in Italy, Dr Enrico Bielli, my first boss at HiRoss showed me what a powerful combination enthusiasm and imagination could be, and that it was okay even for an Englishman to wear his heart on his sleeve sometimes. In the US, John Lee, who ran a distributor in Washington DC, showed me how important it was to surround yourself with the right people and that those people could be found in all walks of life if you kept your eyes open. Young Slack, another distributor, this time in Dallas, Texas, showed me that as a sales guy, your time and knowledge had value and if a customer didn’t respect that, he probably wouldn’t buy from you either. 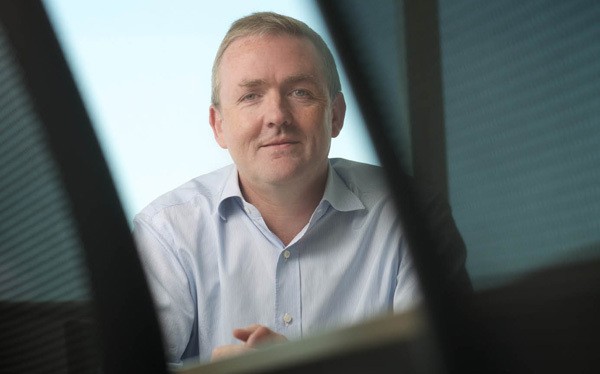 Steve Pegg, Farr Company CFO, tried to show me how to be honest and direct with hard truths without being abrasive or unduly harsh. And Jack Meany, the former Farr Company Chairman, reminded me that not all the answers you seek could be found in a laptop and that it paid to turn off the IT sometimes and observe the world around you, since that was still where most of the really important information could be found. These are just a few examples of received wisdom. But, I think that if you keep an open mind and are prepared to listen carefully, you can learn something from almost everyone that you meet in life. The challenge as you get older, of course, is to try to stay young at heart and keep your mind open to those new ideas. It’s something I try to do every day. I’m married to Melodie, a Mid-Western girl from Nebraska. She’s a Thunderbird Graduate, as well. We have two children – Ava is 10 and Zack is eight – both born in Singapore, but very much enjoying living in Dubai. In the little time my business travels and a young family leaves for other pursuits, I remain an avid reader – nowadays mostly of history books. 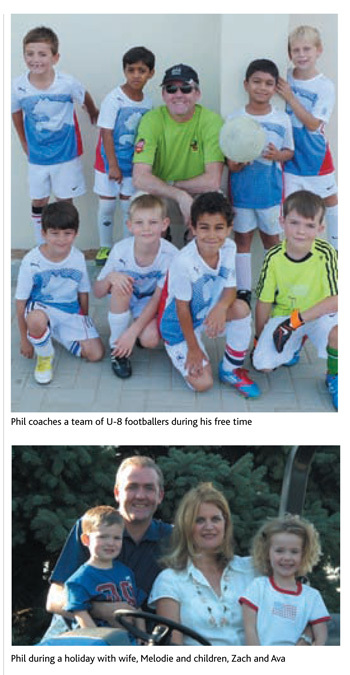 I also coach a team of U-8 footballers mid-week and weekends. I play a little golf. I’ve taken advantage of being here in Dubai to try boating. I have a small cruiser in the Dubai Marina. An amazing thing – write a cheque, get the keys to a four-tonne, 9m, 300+ HP machine – no experience asked for, no license required, no training provided. My philosophy of life? “Almost everything succumbs to hard work”. And, if you can do that hard work in a foreign land with an interesting culture, all the better! I am Dr Enrico Bielli mentioned in the article and I would like to have Phil Whitaker’s e mail address , please .He had nice words for my work in his article and I would like to thank him personally .